African Lovegrass (ALG) is a highly invasive environmental and agricultural weed in the region. The Southern ACT Catchment Group has a Quik Spray Trailer available to assist landholders and managers across the ACT as well as Googong and the Upper Murrumbidgee catchments to undertake weed contol. A donation of $50 for the first day and $25 for subsequent days applies. See the flyer attached for conditions. The ‘eofys’ (end of financial year) monster will and should be used by all as an all round excuse for things being late. I will of course use this same excuse for as long as I can get away with it. Here, finally, in mid winter, is the report for autumn. Well above average rainfall for February, March and May, has had a big impact on our region over autumn. The dams topped up to about 56% for the first time since 2006 (ActewAGL data) and the long suffering Murrumbidgee River also managed a clean out and a top up during this time. 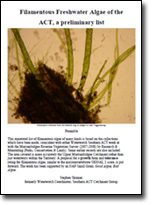 The Good Algae and Bad Algae final report is now available for pdf download. The report has been divided in three for smaller downloads. 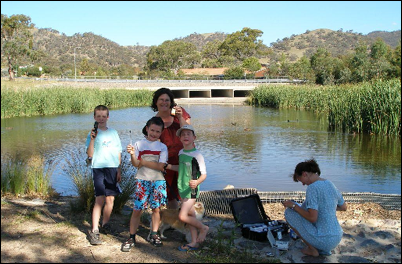 Julie Marriott and family and Vera Kurz have been an active Waterwatch team for a few years. They keep a close eye on a system of artificial ponds known as the ‘Conder Wetlands’. ‘Living with Lovegrass’ a forum designed around learning from each other on how to manage African Lovegrass was held at the Namadgi Visitor Centre on Saturday 22nd May. Around sixty people attended the forum and it was interesting to hear the range of views expressed about lovegrass. Some graziers expressed the view that lovegrass is here, cattle can use it, so perhaps we are better off devoting resources to Serrated Tussock. Others thought that lovegrass is potentially our worst environmental and agricultural weed species. Whatever the view there is no denying African lovegrass is a highly persistent, summer growing, perennial grass weed that is invading rural properties, urban parklands and roadsides and nature reserves across our region. The World of Tidbinbilla is a user-friendly guide to the beauty, the riches and the history of Tidbinbilla. The guide was launched by the Minister for Environment, Simon Corbell on 9 October 2010 at Stage 88. The United Nations proclaimed May 22 The International Day for Biological Diversity (IDB) to increase understanding and awareness of biodiversity issues. When first created by the Second Committee of the UN General Assembly in late 1993, 29 December (the date of entry into force of the Convention of Biological Diversity), was designated The International Day for Biological Diversity.